We can use this as a metaphor for the necessary changes that have to take place within people and institutes so that they can do a better job at sharing their valuable agricultural knowledge — sharing has to become part of their ‘genetic make-up’. We need to have ‘genes’ that hold the knowledge sharing values on which an organism can build, that have the necessary information to maintain ‘pathways’ for the organism, and that can pass on the same traits to others, especially young people. All of which sound like the traits of a ‘gene’ many of us in the CGIAR and beyond already know: Jean Hanson, Leader of Forage Diversity at the International Livestock Research Institute (ILRI). This blog post pays tribute to Jean as ILRI celebrates her long service with the Institute and the agricultural research for development community. While Jean will officially retire this week, we are sure she will continue to be a formidable force in her field. 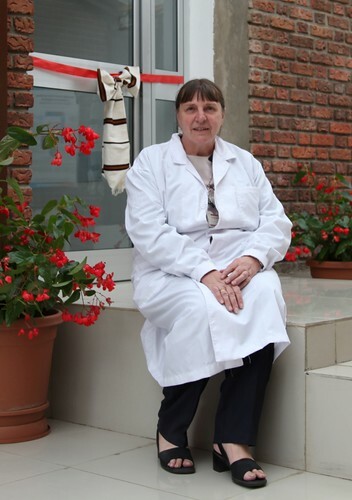 While Jean is well known, not just within the CGIAR and Ethiopia but also around the world, for her scientific work in the field of preserving and managing plant genetic resources, we would like to pay tribute to her in another arena in which she has also been active: knowledge sharing. To help me tell the story of Jean Hanson, the sharer of knowledge, I have asked a few people who have worked with her to share some of their experiences and stories of the Jean they know. With her warm and open personality many people would recognize Jean as a natural communicator, but she took this natural ‘genetic’ characteristic much further as she plunged into the world of knowledge sharing through her work. On many occasions, I was able to discuss the value of and the opportunities for knowledge sharing with Jean. She often talked about her ideas and thoughts on knowledge sharing, as well as the early methods and tools she had applied in her work. Shortly after arriving on the ILRI campus in Ethiopia, Jean invited me to participate in the inception workshop of the ASARECA Napier grass project, which she was leading. And this was no ordinary project workshop. Jean had decided that to really learn about and address the diseases affecting the important fodder resource that is Napier grass, new mindsets and toolkits were necessary. She elected to make use of Outcome Mapping in this research project as a way of planning, implementing, and monitoring and evaluating the necessary behaviour changes required to achieve the project’s goals. So while Jean had the passion and values for sharing knowledge, she also felt that she (and her team) needed to be better equipped with tools and methods to collaborate with others and share knowledge. Jean Hanson was one of the 20 or so participants of our first knowledge sharing (KS) workshop. For the Institutional KS project this event was a cornerstone: it opened us to a new partnership with FAO on the KS Toolkit and Knowledge Share Fairs. It provided some participants with the opportunity to document and analyze their workshop experience and the implementation at work of some of the ideas, tools and methods in a peer-reviewed journal article. Finally, it led later on to some exciting work on the use of social media as a complement to our efforts towards more inclusive events. Jean was a special participant because she is a senior scientist and I guess the only one we had in the workshop. We appreciated her interest, her initiative to bring in some of her team members, her ability to put the tools, methods and principles we were exploring into the perspective of her lifelong working experience as a scientist, her curiosity to discuss with us and her ability to suspend judgment to discover a new area with fresh eyes. Jean didn’t just keep her values and pathways to herself. She has been a big proponent of getting more knowledge sharing into the projects she leads, the genebank, the Institute, and the staff working there too. As I was looking for work in Addis, Jean came to me in April 2009 and said she might need me for the ASARECA project on Napier grass disease resistance. She made me feel at home within the Forage Diversity team and I started learning about Napier grass and how to communicate information about the diseases affecting the forage and the consequences. After I started working on the project, I built a website with Esther Gacheru. Jean let us experiment and was keen to tell us about the tools to use and ways to communicate results from partners. It was a lot of fun learning to do that and we got a lot of support from Jean, who gave us time and encouragement. I could always go to her with any question. She was always there for us, surrounded by books, papers and material — a real scientist’s office. We also ran a workshop about Napier grass in May 2010 and I was happy we had an opportunity to experiment with different ways of presenting our work . We also held discussions facilitated by Julius Nyanganga, Capacity Development Officer (ILRI) and Nadia Manning-Thomas, Knowledge Sharing in Research specialist (ICT-KM/ILRI) using fishbowls and world cafes, which were new to some participants but well appreciated. Jean is very innovative and concerned about communicating science. At the last Share Fair in Addis Ababa in October 2010, she was in charge of a stall showing different seeds, and explained how forage was part of everyday life (e.g. weaving it to make baskets) and had great ideas about how to display different knowledge sharing methods. We were going to hang old diskettes, CDs and flash disks, etc. from trees. It didn’t happen but we had fun imagining the kind of museum that one day might store such items in the Forage Diversity building. Jean is also very welcoming and positive about meeting students from all over the world, supporting and taking the time to help them with their work. Merci, Jean! And here’s to all the great discussions to come, now that you will have a (little) more time — or? While our “Growing Talents: Young Voices in Agriculture” series of interviews, usually puts a face to the youth in ARD, hears their voices and obtains an insight into their roles, perspectives, experiences and aspirations, we feel that it is important to show the senior figures that help to support, mentor and ‘grow’ all young talents out there too… and Jean is one such person. We hope that many more senior scientists will see the importance of knowledge sharing and capacity development in their institutes and arenas and support young people to use the various tools at their disposal, the way Jean has… and plans to continue to do so. Jean – on behalf of Simone, Genevieve, the ICT-KM team and many others in the knowledge sharing and capacity development community – I would like to thank you for your dedication to the cause and hope that you will keep passing on your traits.